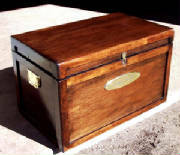 "Bird Song Tack Trunks are made by American craftsmen who have designed and built equine tack trunks for decades. These tack trunks are not designed to look like other tack trunks - these are tack trunks for a new generation. 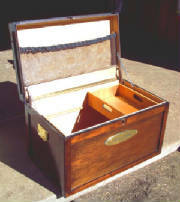 All Bird Song Tack Trunks are made of durable high-grade veneer plywood with hardwood trim and available with a variety of options. Saddle trunks, Dressage trunks, Horse Bit Boxes and Standard size equestrian tack trunks available in Mahogany, Chestnut and Walnut finishes. Bird Song Tack Trunks are engineered to last and are protected with marine-grade urethane triple overcoat. 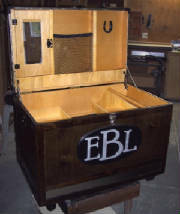 Even the Horse Bit Boxes are available in matching style and finish. 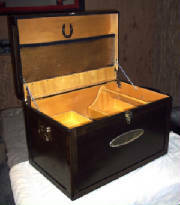 Bird Song also designs and builds Custom tack trunks to meet requirements of the most discriminating equestrian". Finished Interior with Cargo Net and Helmet Hook.